I haven't been very productive of late, been a bit distracted with the remodel that has drug on for 6 months when it should only been 3 at the most. But here are 2 things I have completed. Above is a lingerie bag, it is in the style of a vintage one and is done in rose bud materials in pinks and reds. The eyelet is such a wonderful over skirt and is from my ever growing collection of fabrics in my rescued pile. I made the little ribbon rose also. It would be a lovely addition to any closet and would hold quite a bit, it could even be used as a laundry bag for the unmentionables. 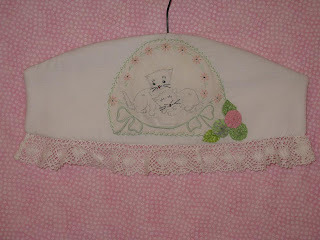 I love this padded hanger it is just so cute, the kitten motif is also from the rescue pile it is vintage and was on an item that was beyond repair. The design is my own as I had no pattern and had to fit it as I went. The cluny lace is also from my stash , it is white, it looks a bit pink because of the back ground fabric. 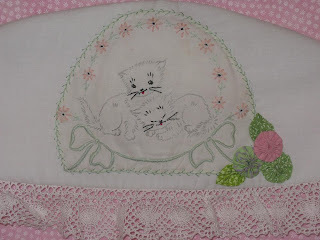 A close up of those darling kittens, I did the feather stitch embroidery around the kittens and made the leafs and the yo yo's. I think this would so cute in a child's room, it would do well with the cottage look and of course the whimsy look would be perfect for it. I love to re purpose things, and try to rescue as much of those vintage linens and laces as I can. Have a great day TTFN. both are on my side bar. Labels: Lingerie bag, padded hanger.